A colour photograph of the Merryweather Steam Fire Engine in the lobby of the Whitby Public Library Central Branch. This view is of the logo on the side of the Fire Engine. 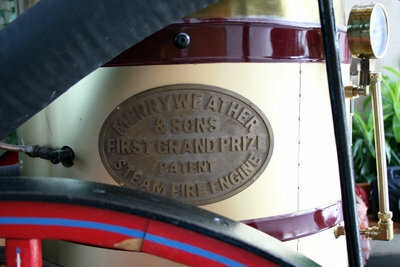 Merryweather Steam Fire Engine, September 10, 2013, Megan Pugh. Whitby Archives D2013_007_007.